Most of the questions I received were in the past couple of days and almost all of them dealt with gun control. But I think what I wrote earlier today is a good response to those queries. First, I’m glad that someone else posed the question, because I wouldn’t be sure whether to ask “Are the media biased” or “Is the media biased.” I’m sure there’s a Grammar Nazi out there who knows the answer. But back to the point of this post, I think the answer to both questions is yes. Conservatives and libertarians are whining, but that’s very understandable because the press does try to help the other side. And I have several examples. But I want to emphasize a key point. 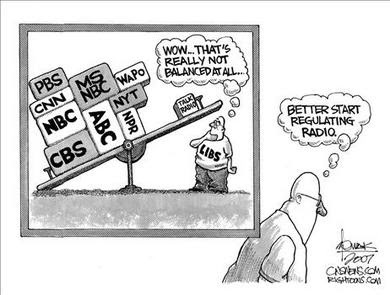 Media bias very rarely involves dishonesty. Deception yes, but not inaccuracies. It’s almost always about story selection and what gets emphasized. Even when there’s a clear-cut mistake, such as the jaw-dropping New York Times assertion about lower education spending, I suspect it’s the result of group-think rather than a deliberate decision to lie. But there often are deliberate decisions to steer the debate in a certain direction, and I there’s a very good example in a new expose by the Daily Caller. They caught the folks at Bloomberg highlighting poll data that helped Obama and burying the results that might give aid and comfort to the GOP. A poll conducted last week by an Iowa-based firm showed Americans are conflicted about whether or not to support raising tax rates on wealthy Americans to avert the so-called “fiscal cliff.” But that’s not how Bloomberg News, which commissioned the poll, reported the results Thursday. In a story headlined “Americans Back Obama Tax-Rate Boost Tied to Entitlements,” Bloomberg emphasized only that the poll showed most Americans support President Barack Obama’s insistence on increasing taxes for high-income earners. “A majority of Americans say President Barack Obama is right to demand that tax-rate increases for the highest earners be a precondition for a budget deal that cuts U.S. entitlement programs,” the story, written by reporter Julie Hirschfeld Davis, began. …But in the same poll, American adults were asked “whether it is better to raise the top tax rate the wealthy pay, or to limit the amount people can claim in tax breaks, such as mortgage interest and charitable contributions, so they end up paying tax on a bigger share of their income.” Fifty-two percent responded that they preferred limited tax breaks to a tax-rate hike. Only 39 percent said they would rather see tax rates on the wealthy increase. Nine percent indicated they weren’t sure. …Bloomberg mentioned the second question in the story’s 20th paragraph, and gave no indication that the results suggested support for Boehner or House Republicans. Kudos to the Daily Caller for catching the folks at Bloomberg with the hands in the cookie jar. Notice, though, that there are (presumably) no falsehoods or fabrications in the Bloomberg report. The bias shows up in terms of what gets prominent coverage and what gets buried. Gee, what a big concession to fairness. P.S. You can see a couple of good cartoons about media bias in this post, and another good one at the bottom of this post. I don’t feel any buried aggression towards conservatives. Some of my best friends are conservatives. Everette, Fox compared to all other cable news networks(outlets)? That certainly doesn’t level the playing field against the major networks, most magazines and most of the newspapers that all lean severely left. Paul – I sense you have a little buried aggression towards conservatives. Do you believe that calling them such names is a good way to make them allies? Many conservatives are much closer to Libertarianism than regressives. Fox News helps level the playing field. Did you know that more money is spent by advertizers for space on Fox News than all the other news outlets combined? It’s funny that WaPo, NYT, and NPR are positioned slightly to the right of the fulcrum. Also funny is the appearance of “LIBS” on the shirt of an illiberal who is a leftist or a progressive. Why funny? The cartoon is clearly meant to pander to rightwingers, and “LIBS” is even a rightwing pejorative. Yet most rightwing conservatives are too closedminded and too stupid to figure out on their own that leftists appropriated long ago the word liberal to disguise the radical illiberalism of leftism and progressivism. Further still, the right wing conservative is so pig headed that even when it admits what leftists did to political language, the rightwinger still refuses to stop aiding and abetting their illiberal cousins, who understand well enough the reptilian nature of rightwing talk radio and who could do a lot worse than to smother it with a crushing burden of regulations. First, I can’t believe anyone even asks this question anymore. Media bias goes back at least to Walter Concrete and the Tet Offensive. And it’s not limited to the U.S. media, as evidenced in this wonderful little piece: http://www.youtube.com/watch?v=bDw5a0_iFBk. Now, the CBC later expressed ‘regret’ over the inadvertent juxtaposing of the two clips in Lawand’s report, but that in itself was BS. The report was an obvious attempt to smear Harper, and there’s no way to deny that. Second, while technically “media” is the plural of “medium” and should take a plural verb, English usage has turned it into a singular (and the monolithic nature of the main stream media has added to that effect), so using the singular verb will only get you into trouble with the most prescriptive of grammarians. Brent Bozell and the Media Research Center spend a lot of time trying to expose the bias in the media, and their website http://www.newsbusters.org is a great source for reading about it. And you’re right, most of the time the bias comes in the form of what gets reported. However, I also notice a lot of bias in the WAY things get reported, including terms used (such as pro-choice vs. anti-abortion), ratios of liberals to conservatives interviewed, selective editing, etc.